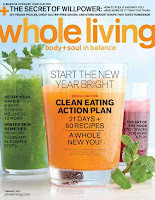 Today only, 5/21, you can subscribe to Whole Living Magazine for two years for only $7! Whole Living magazine offers smart ideas on taking care of yourself, your family and the planet in ways that are natural and sustainable. It promotes wellness, fitness and beauty, balance, community and living green. This offer expires at Monday 05/21/12 11:59 PM EST. You can also take 20% off any other magazine at DiscountMags.com using coupon code JINXY.